The Time Lords are regenerating from a different dimension never seen before! The Doctors lead the way as the first release in the Kawaii Titan format, designed by legendary Titan Comics Doctor Who cover artist, Kelly Yates! Adored for their differences as much as their shared sense of adventure, this collection is a unique homage to everything that makes our favorite Rebel Time Lord so eternally popular! This collection of stylized vinyl figures is just what the Doctor(s) ordered! Ages 15 and up. Each mini-figure measures approximately 3-inches and comes blind-boxed. There are even hidden chase figures for you to hunt and collect. 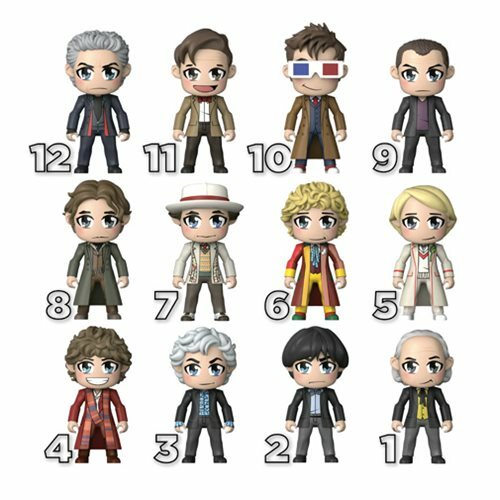 Doctor Who 13th Doctor 6 1/2-Inch Kawaii Figure - 2018 Excl.